The results are very interesting as the Pixel XL and Pixel prove themselves as one of the best in having longest battery, just behind the Galaxy S7 Edge and Galaxy S7, current kings of HighOnAndroid SOT tests. Of course, my Galaxy S7 Edge results had to be thrown out as I totally forgot to reload a stock firmware (I had a custom ROM w/ a custom kernel) while the Nexus 6P ended up with slightly shorter battery life than the last time we did the test 11 month ago. For those of you worried about battery life on the Pixel XL or Pixel, you should be pretty happy that both phones lasted over 8 hours. To see all the SOT results of this test and previous tests, see our HighOnAndroid SOT Test page. 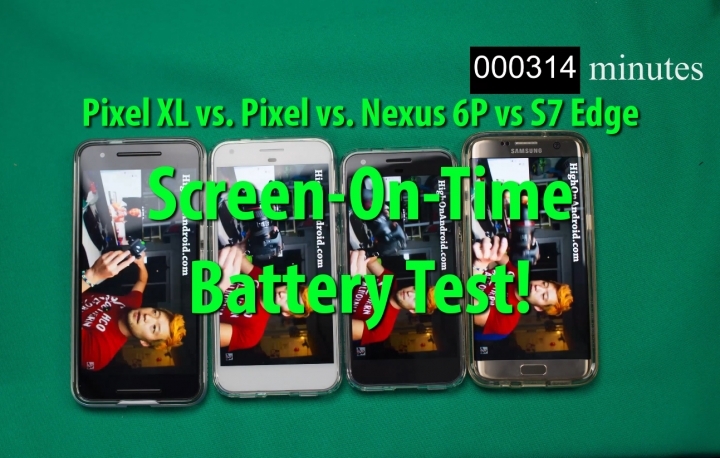 Next story Pixel vs. Galaxy S7 Edge Video Camera Low-Light Test! Previous story Pixel XL vs Pixel vs Nexus 6P Camera Low Light Comparison!